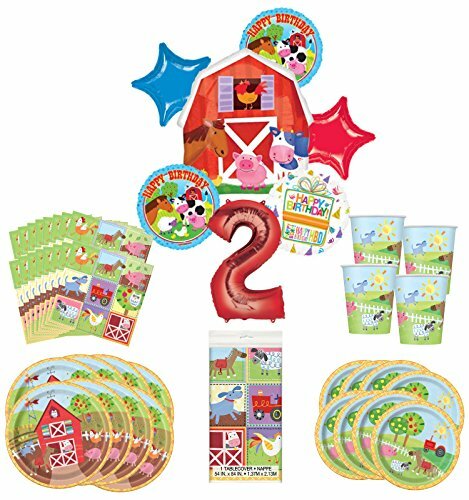 With this complete Barnyard Farm Birthday Party kit you will receive: (1) 22" Barnyard Fun Foil Balloon (2) 18" Happy B-DAY Farm Animal Foils, (1) 34" Giant Red Number 2 Foil Balloon, (2) 19" Star Foil Balloons 1- Red and 1- Blue (1) 18" Birthday Present Foil Balloon, (8) 9" sq Barnyard Farm plates - (8) 7" Barnyard Farm dessert plates, (1) Barnyard Farm - Table Cover - (8) Barnyard Farm - 9 oz Cups and (16) Curious George - Lunch Napkins. Just add Helium and ENJOY!! Dinnerware by Amscan and Balloons by Anagram.